Colorful, playful party dress for an exciting anniversary party! Over the weekend we attended a really fun and memorable 10th anniversary party of some good friends. I knew from the colorful invitation suite (and checking with the hostess!) that everything was going to be really bright and fun, with lots of pink, yellow, orange, and black/white. I wanted to make a new dress for the occasion but didn't have a specific design in mind - so I went to the fabric store looking for the perfect fabric that would speak to me! 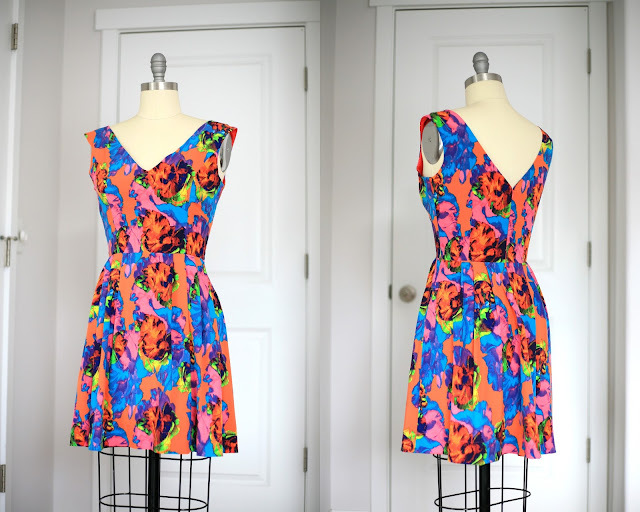 I debated about a solid color coral, thinking I'd make something strappy with a natural waist, sweetheart neckline, and pleats, but I also found this super bright (is it a floral? I almost can't tell) Nicole Miller print. It did take me a while to pick the pattern for this one, and in the end I mostly made up the style and modified Simplicity 1415, which is just a basic princess seamed fit-and-flare dress. The fabric is the Nicole Miller Stretch Chiffon Fabric-Flash Multi. I really don't like polyester, but this one has a soft feel to it almost like a washed silk and the matte look and slight stretch make it much better than a classic silky poly. I cut down the v-shape in the front and narrowed the straps a little. Oh, and I had to cut down the armholes - and they were still a little tight for my preference. I guess I have bulky armpits? Pecs, maybe? The back already had the v shape. I used the skirt pattern exactly as the pattern called for, though I gave it a deep hem because... when do I ever get a chance to wear short party dresses and heels?! The color was making a statement, I figured the style could, too! Going all out! I also got new shoes for the occasion! Over Memorial Day weekend I literally spent 4 1/2 hours shopping for shoes online - I felt pretty yucky afterwards. I loved these chunky pumps from Express but ended up getting these similar ones from Target - they came in half sizes, I could pick them up in-store (no shipping timing worries), and they were a great price. (I am now well-versed in the options; see a few similar ones linked below!) I LOVE the chunky heel, makes it feel way more fun and not like I'm going to a wedding at an art gallery. It felt really special to have a bright, totally unique party dress to wear and I got compliments - but most importantly, my friend the host loved it! And it did go with the decor. I know what it's like to throw parties and wonder what everyone will wear... and it's so fun to dress for a theme! I linked the shoes I got, and the others I seriously considered over my party shoe shopping intensive, below, and similar shoulder bags!